This first post of the series provides an introduction as to what Esri’s Tapestry Segmentation Dataset is comprised of and how Stratasan uses it. This will differ from past posts about Tapestry by providing a deeper dive into the dataset. Additionally, to illustrate the various levels of granularity within the Tapestry data, we'll look at a couple of specific LifeModes and the Segments that fall within it. 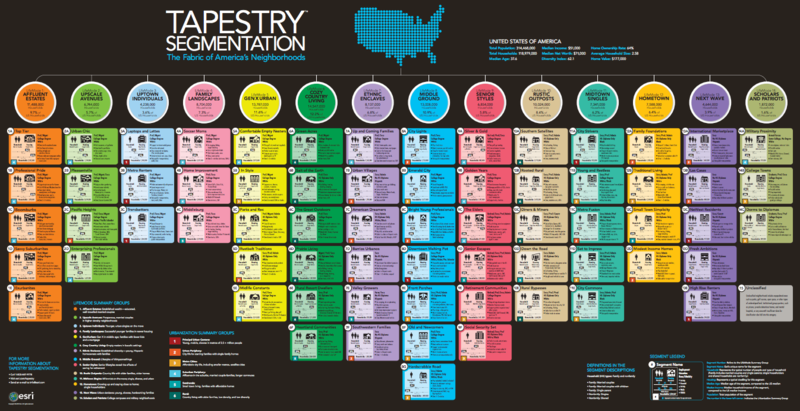 As a first step, let’s dive in and examine exactly what is Esri's Tapestry Segmentation. 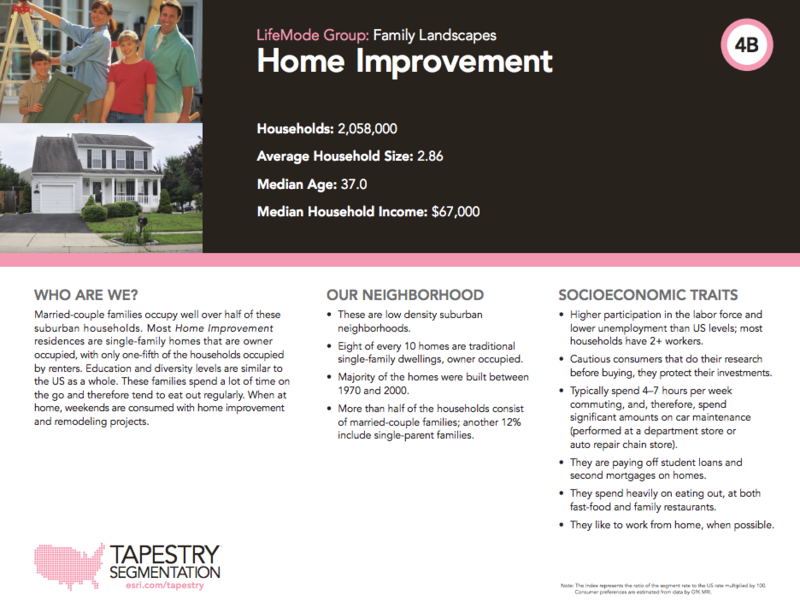 Esri’s Tapestry is a market segmentation system designed to identify consumer markets in the United States. It incorporates the effects of growth and decline over the last decade on established consumer markets, as well as the emergence of new markets populated by the Millennials and immigrants. The overall result is a reflection of the increasing diversity among American consumers. Tapestry was designed specifically to understand customers' lifestyle choices - what they buy and how they spend their free time. This information gives Stratasan, and our clients, insights that help identify facility’s patient types, optimal sites for hospitals, physician offices, FSERS, and urgent care locations. We use the Tapestry Segmentation dataset to help our clients get higher response rates, avoid less profitable growth opportunities, and invest their resources in the best ways possible. To better understand how Tapestry works, you first must understand how it is formatted. Throughout the US, areas are divided into 67 distinctive segments based on their socioeconomic and demographic composition. These segments can be grouped up into 14 LifeMode Groups and 6 Urbanization Groups. 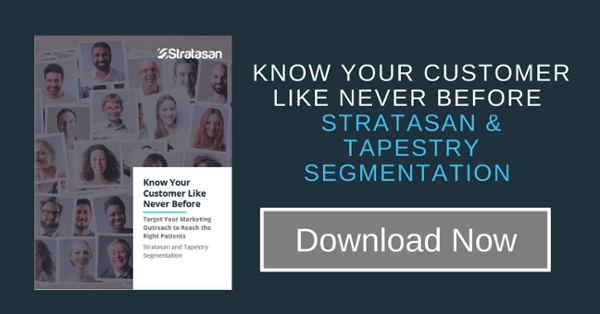 Stratasan runs the Tapestry analyses on the 67 segments. Depending on the audience, their technical understanding of the data, and what they are looking to accomplish with the results; we can group the segments by 14 LifeModes or the 6 Urban groupings to generalize the results. To see these various segments and their descriptions in more detail, check out Esri’s Tapestry Website. To illustrate the various levels of granularity within the Tapestry data, we'll now break down the Family Landscapes LifeMode. Family Landscapes has three Segments that fall within it, which we will delve into as well. Homeowners (80%) with mortgages (second highest %), living in newer single-family homes, with a median home value slightly higher than the U.S. Prefer the suburban periphery of metropolitan areas. Predominantly, single family homes are in newer neighborhoods, 36% built in the 1990s (Index 253), 31% built since 2000. Owner-occupied homes have a high rate of mortgages at 74% (Index 163), and low rate vacancy at 5%. Median home value is $226,000. 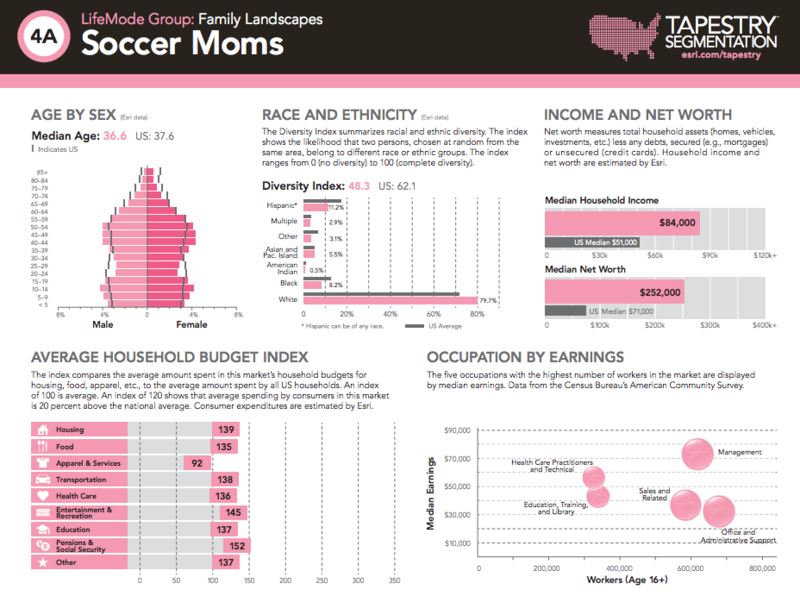 Most households are married couples with children; average household size is 2.96. Most households have 2 or 3 vehicles; long travel time to work including a disproportionate number commuting from a different county (Index 133). 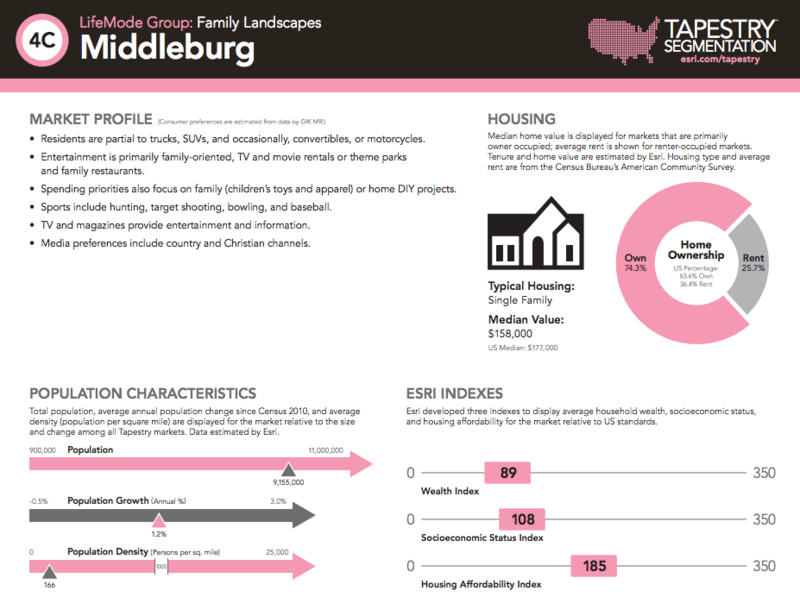 For each segment, Esri created a four-page PDF That includes a description/summary slide, a demographic breakout slide (which you can see below), a market profile slide, and a map showing the concentration of the specific tapestry segment across the United States. Neighborhoods changed rapidly in the previous decade with the addition of new single-family homes. Include a number of mobile homes (Index 152). Affordable housing, a median value of $158,000 (Index 89) with a low vacancy rate. Young couples, many with children; average household size is 2.73.